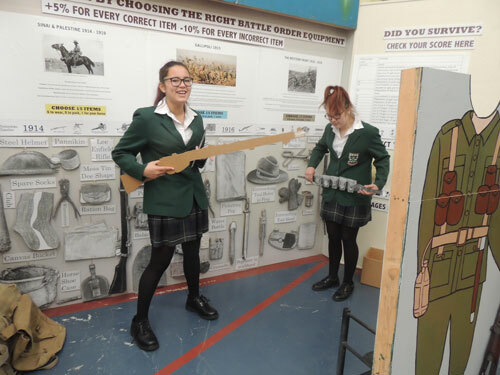 Survivor WW1 provides a social, interactive, kinesthetic learning experience to your visitors, at minimum cost. Experiential learning that “brings to life” the statistics, campaigns and artefacts of the NZ WW1 soldier. It can stand alone, or be used to compliment traditional artefact and text displays, or schoolbook learning. 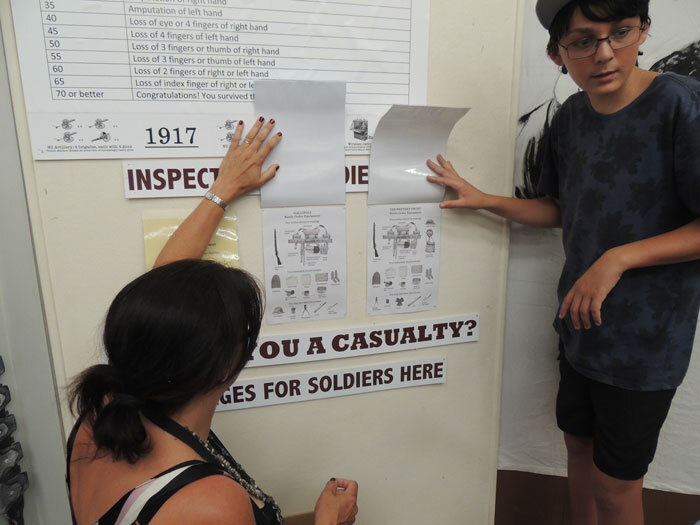 Survivor WW1 is small, robust, and low tech: Designed to be affordable and easy to make and use for a wide range of venues such as museums of all sizes, libraries, RSA’s and schools. What does Survivor WW1 Consist of? A family scores their soldier's equipment. The activity is started by spinning a wheel. The wheel is divided according to the NZ WW1 casualty numbers. This gives the participant a campaign, Sinai & Palestine, Gallipoli, or The Western Front, and a corresponding initial survival rate: 90%, 36% and 18% respectively. Participants then attempt to increase their score by dressing a soldier cut-out in the correct Battle Order Equipment for their campaign. Points are awarded for each correct item selected, and subtracted for each incorrect item selected. Participants then “inspect their soldier” by referring to the answers under flip panels. Their final score determines their survival outcome, which relates to the WW1 war pension; e.g. a low score of 10% will be the maximum rate of injury as listed under the war pension (lunatic, paraplegic, blind, bedridden etc.) 60 % will be a minimum rate of injury (loss of digits), 70% and above will be fit and healthy. 0% and below do not survive. How is Survivor WW1 be delivered? As a digital file for printing with an A3 photocopier, with DIY construction from low cost recycled materials, mostly cardboard. A small amount of handy-man level carpentry is required. We recommend enlisting the help of 5 or more volunteers to glue photocopies onto cardboard, and cut them out. As a digital file for construction in durable sustainable materials, such as Ecoply and Vertiface. Requires skilled labour and commercial printing. How much does the Survivor WW1 cost? The cost for the digital files are $1490 + GST, for a year, with a $150 annual renewal license thereafter. DIY Economy from digital file is ideal for small museums, or schools, that have volunteers to help make it. Cost of materials to make is less than $500. DIY Crafted. Cost of materials and labour to make approximately $5000. This is for museums that have skilled technicians, or that can afford to pay commercial exhibition fabricators and printers.